Electroneum features a gamified mining experience for users, which will kick off a crowd sale later this week. The cryptocurrency industry is one of the most explosive and fastest growing in recent memory. In light of Bitcoin and various alt coins’ recent surge, the industry is primed to welcome its newest entrant, Electroneum. The new cryptocurrency will focus on a more gamified mining experience, capable of disrupting the traditional status quo. Finance Magnates sat down to speak with the currency’s founder Richard Ells who touched on Electroneum’s inception and subsequent framework and goals. In your own words what is Electroneum in a nutshell? 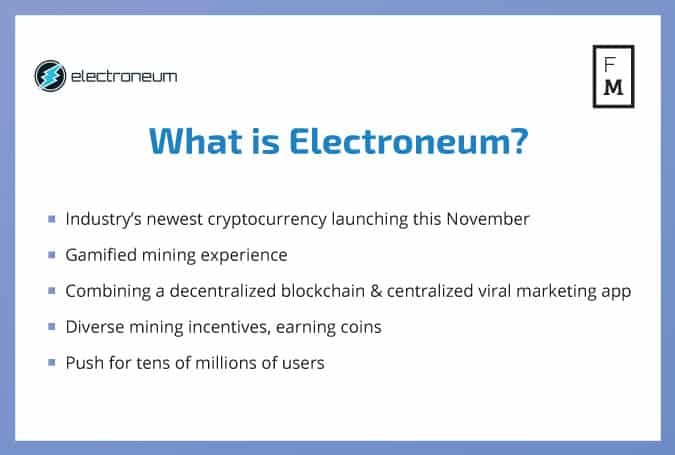 Electroneum is a brand new cryptocurrency that is launching on November 1st, 2017 that is designed to appeal to mobile phone users. You can even ‘mine’ our cryptocurrency via our free app. We are launching a crowd sale on the 14th September to allow the wider community to get involved. Tell me a little about yourself and how you started the Electroneum team. 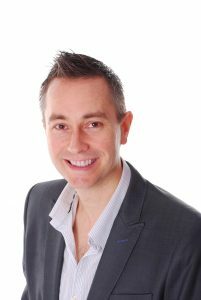 I started a digital agency called SiteWizard Ltd in 1997 (it’s still running today, with 20+ staff, but I don’t spend much time there). That in turn led me into the world of social media where I started Retortal Ltd, which has grown to have over 100,000 users, and will soon have millions of users. We’ve previously partnered with some of the biggest brands in the world such as Herbalife, Avon, Forever Living, Mary Kay and more. I’ve always focussed on delivering software with a great user interface experience that enables us to grow a huge audience. What has always frustrated me is that every new cryptocurrency that launches along seems to be the same as the last. No radical shift has taken place. So, I came up with an idea to get cryptocurrency into mass adoption for the first time. Actually, Bitcoin is known by a pretty wide audience, however it’s not used or owned by a very large audience. A recent study by Cambridge University suggests there are only around 3 million bitcoin users and holders. We aim for tens of millions or even hundreds of millions of users. It is worth remembering Pokemon Go garnered 90 million app users in just six months – and they didn’t pay their users! Have you secured anyone behind the Electroneum team that we have heard of? Of course, we have a number of tech and finance superstars backing Electroneum but the most public one is Duncan Logan the CEO of Rocketspace who nurtured the likes of Uber, Spotify and Hootsuite. Duncan is publicly tweeting and posting about his intention to buy in to Electroneum as it is something entirely new. How is Electroneum different than other cryptocurrencies? We’ve combined a decentralized blockchain with a centralized viral marketing app that encourages the adoption and accumulation of cryptocurrency through “gamifying” the experience – we call it the Mobile Mining Experience. Our blockchain emits coins to our mobile app users to bring a different utility to the blockchain. Electroneum full miners earn the most coins and that runs on Windows, Linux, and Mac computers. They bring the utility of blockchain administration and are rewarded with Electroneum coins. The mobile miners bring the utility of viral marketing to Electroneum and are awarded with a number (smaller) of Electroneum coins for doing so. It’s done in a way that encourages app usage. We’ve essentially gamified the mining experience, making it appeal to mobile computer gamers (there are over 2 billion of them). Do you think cryptocurrencies will change the face of finance in the future? It’s still very hard to tell – we are at the point in cryptocurrencies where airplanes were at the start of the Second World War. People underestimated their usefulness and power and almost ignored them. Once the technology got the attention it deserved, however, people looked at it in an entirely different way and it changed literally everything. I can’t predict the future, but blockchain and cryptocurrencies will be growing exponentially for some time to come. Another analogy I use (and this might only work in the UK) is the battle between VHS and BETAMAX video players back in the 1980s. Whilst in the UK VHS “won” – where are they today? A museum at best! We are all part of moving cryptocurrencies forward and each new player brings something exciting and dynamic to the table. Most people have been focusing on technology and features, we are focusing on market share and adoption. How do you intend to bring micropayments to people without access to bank accounts? Our app makes micropayments simple, and after we raise some funds during our token sale we can take that even further with contactless transfers and much more. However, the important thing is that these people have had android devices for ages – they just haven’t used them for micropayments because they don’t have anything to pay with. If we can get some cryptocurrency into the hands of a community through mining, then they can start using as a means of exchange that never involves a bank. Previous cryptocurrencies have always started with a trip to the bank – or a powerful computer for mining – we’re the first that doesn’t need either. How does mobile mining work on the Electroneum app? The mobile app is centralized and runs off a twin algorithm that emits coins from the blockchain at approximately the same rate as the full miners based on a CPU benchmark of the phone. This allows the phone to run without getting hot and without using tons of power and bandwidth that previous attempts at phone mining have needed. It is important to remember that they are not bringing blockchain utility, they are bringing a different utility – they are bringing on users at a ridiculously low CPA, and allowing Electroneum to have viral growth. Do you have closing thoughts regarding Electroneum? Because we’ve centralized part of Electroneum (the app based part) this also means we can evolve far more than other cryptocurrencies. Since nearly all cryptocurrencies are purely decentralized, once their code is launched it takes a hard fork to change anything. This is still true of our blockchain model, but because our app is fluid and centralized, we can act very dynamically. We can evolve the app. For instance we are designing an app-based game that teaches people how cryptocurrency works and lets them slightly increase the hashing rate of the mining app by interacting with the game. You don’t have to play it to mine, but it’s got features from some of the most addictive apps that have come before. We have all the benefits of a decentralized cryptocurrency with all the benefits of maintaining centralized control of our app. how will electronieum make money and become valuable? You should be able to transfer your coins to a wallet that can then be exchanged for USD on some platforms. Not all that complicated….I think that’s the thing the frightens people away. Funny! The VHS won the battle against BetaMax not only on the UK, but on the whole world! I think What the people What to know is, Why invest for exemple in “electroneum” and dont leave the money in the wallet rentabilize and then sell imiddiattly? I inclusive have money in “electroneum” and i have in coinbase”- one wallet só wich difference one for other? Electronum is New type of crypto currency? New tecknology? Or new bussines strategy? Is this a …”game”:type of cryptocurrency? Like a sports game app? It will be better than other cryptos that don’t do anything then exist to be exchanged on trading platforms. This is a welcome development. I just hope the mined coins will be convertible straight to local national accounts and not the usual logjams of coin conversion to bitcoin, then to domiciliary account. Hi Richie, what’s the potentiality of this whole thing? Can you vouched for this incentive of yours? Please i need more clarification on this new Cryptocurrency. Is there already existing internal and external exchangers for this coin? So one can easily convert the coin to real cash.